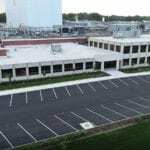 Ohio Paving & Construction performs line striping and pavement marking services for new parking lots in Cleveland, Cuyahoga County and Northeast Ohio. We also re-stripe existing parking lots and parking spaces. Since 1989, we have been line striping and pavement marking large multi-aisle parking lots as well as small parking lots with a single row of perpendicular car parking stalls. Parking lot line striping prices, pavement marking rates and parking lot line painting costs are listed below. Call 440-975-8929, email info@ohiopaving.com or click here to complete an inquiry form. Re-striping is performed when the lines and markings in a parking lot start to fade over time due to vehicular traffic and because of oxidation caused by sunlight. Accident prevention is a major reason why parking lots are re-striped. Striping new parking stalls or re-striping existing stalls may require the process of painting over the existing lines. Old or unneeded pavement markings are blacked out or sealcoating is performed. When existing parking lots need new lines and pavement markings in different locations than the existing lines and markings, the best approach is to create a new layout, sealcoat the parking lot and then paint the new lines and symbols over the sealcoating. Trying to hide the original lines without sealcoating is difficult and rarely recommended. The first step in a pavement marking project generally involves a site visit in which an estimator schedules an inspection of the parking lot and parking stalls. The estimator, whenever possible, will meet with the owner or manager of the parking lot before reviewing the condition of the parking lot. After this review, upon request, an estimate or quotation will be prepared and emailed, mailed or faxed to the parking lot owner/manager. When a new parking lot is constructed or an existing parking lot is expanded, our firm will first design a new layout blueprint. After we schedule the work, our line striping crew will normally complete the line striping and pavement marking work in a day or two. 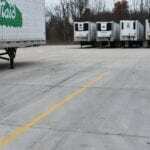 Ohio Paving & Construction performs parking lot layout reviews to determine optimal utilization of parking lot space. This helps to maximize the number of stalls or spaces within the parking lot. This service is often performed before a quote for parking lot re-striping is prepared. During these reviews, an ADA (Americans with Disabilities Act) compliance analysis is also performed to ensure that the parking lot meets these government standards. Pavement markings can become faded and hard to see over time. Re-striping is a fairly inexpensive way to brighten up your parking lot. Costs can range from $3.90-$5.00/stall or $0.10 – 0.20/linear foot for hashing etc. ; $25.00/handicap, $15/arrow. Minimum charges do apply. Costs to re-stripe a typical small parking lot for a church, apartment building, office complex or a small retail shopping center parking lot range from $750.00 to $1,500.00. To stripe a new parking lot with 10-75 spaces normally costs between $200.00 to $400.00. If you or your organization is interested in our parking lot line striping and pavement marking services, please request an assessment, price estimate or firm quote. Proper vehicle traffic and pedestrian flow is analyzed and documented. This portion of an assessment is crucial to reduce liability for the owner of the parking lot. To request a free assessment, site visit, parking lot layout review or estimate, call 440-975-8929, email info@ohiopaving.com or click here to complete an inquiry form. In addition to line striping, other pavement marking incidentals and parking lot layout and design services include the following. Ohio Paving & Construction provides parking lot line striping and pavement painting services for the following types of parking lots. Ohio Paving & Construction, based in Willoughby, Ohio performs line striping and pavement marking services for new parking lots in Cleveland, Cuyahoga County and Northeast Ohio. Other Ohio communities that we service include the following.